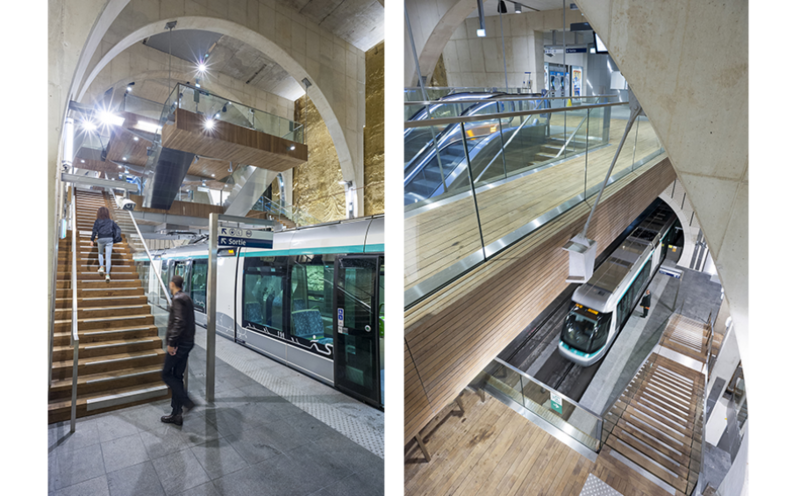 Viroflay Rive Droite and Rive Gauche stations on the T6 tram line, designed by the Schall workshop and built by Eiffage Génie Civil, received an award from the American Concrete Institute and were given a trophy at the “2018 Excellence in Concrete Construction Awards” organized at the ACI convention in Las Vegas. These stations, buried at a depth of 25 m, were built simultaneously. They were included in the program assigned to Eiffage Génie Civil’s teams, along with underground work on the line bored between Viroflay and Vélizy. Both stations boast eight white concrete arches, reminiscent of the 19th century rail viaducts spanning the Viroflay valley. They are particularly decorative, but also provide reinforcement for the stations’ diaphragm walls and support for the intermediate concrete slab housing the machine rooms. They are around 15 m wide and were moreover designed to include escalators. The American Concrete Institute (ACI) has around 20,000 members in over 120 countries and is a leader in concrete research. The « ACI Excellence in Concrete Construction Award » rewards structures involving exemplary ground-breaking technology and an innovative use of concrete, which respond to economic, environmental and decorative challenges. It was awarded to the T6 stations in the prestigious Infrastructure category. It is worth remembering that the international Notre-Dame-de-Lorette Memorial, also known as the Memory Ring (Anneau de la Mémoire), an outstanding structure built of the special industrial concrete BSI® by our Génie Civil teams, was also awarded an ACI trophy in 2016.